1. In a large heavy bottom pot, put in the white sugar and pineapple chunks on medium heat. 2. Stir with a wooden spoon. 3. Turn the heat down to just bubbling. 4. Cook for 10 minutes. Move the pineapple pieces around, to get them in the syrup. 5. Take off heat and move into a heat safe bowl. 6. Let cool until cool to the touch. 7. When cool, use a hand blender to blend the pineapple pieces together. 8. Add in the coconut cream, vanilla and cream and mix well. 9. Move mixture into your ice cream maker. Add the sugar and evaporated milk into a medium mixing bowl and using a mixer, mix until sugar is dissolved. Add in the cream cheese and continue to mix until smooth. Add in the vanilla and lemon curd, and keep mixing until combined well. Add mix into ice cream maker. 1. In a large heavy bottom pot, put in the brown sugar and butter on medium heat. 2. Stir with a wooden spoon until butter is melted and mix with the brown sugar to become a syrup. 3. Turn the heat down to just bubbling and add in the bananas. 4. Cook for 3 minutes. Move the bananas around, to get them in the syrup. Break up the bananas if you need to. 7. When cool, use a hand blender to blend the bananas and syrup together. 8. Add in the cream and mix well. 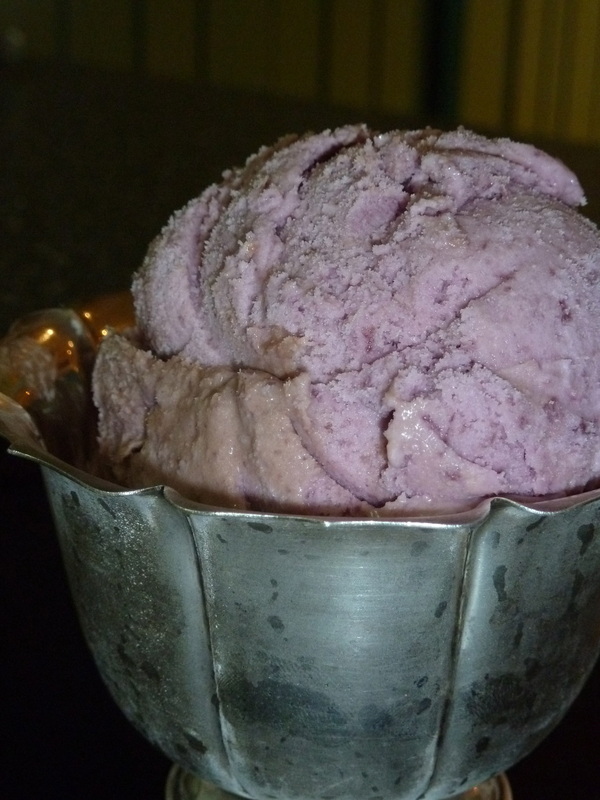 A recipe with few ingredients to make a very wonderful ice cream. 1. Add the sugar and milk into a medium mixing bowl. 2. Use a whisk or mixer to mix until sugar is dissolved. 3. Now add the cream and lemon curd. Mix with a whisk until blended well. 4. Add mixture into your ice cream maker. 5. Break up some of the meringues and put in bottom of container, which you will be putting the ice cream into, when finished. 6. When ice cream is finished. Put half into the container. Then break up the rest of the meringues. Put in the rest of the ice cream. You can serve with a bit of lemon curd dripped over the ice cream, if you want that little bit more hit of lemon. 1. Set up a bowl with ice and cold water in it, so the bowl you will use to mix all the ingredients in can fit on it. So the bowl bottom and sides of the bowl are sitting in the ice water. 2. Cut chocolate melts up to smaller pieces, at least half the size, to help them melt quicker. 3. Measure 1 1/2 cups boiling water. I used from my kettle. 4. Place boiling water into the bowl you will be using to mix in. 5. Add in the chocolate and whisk until all melted. Make sure there are no lumps or un melted chocolate. 6. Once the chocolate is all melted, move the bowl onto the ice bath bowl. 7. Add in the vanilla and Vodka and keep whisking as the mixture cools. 8. 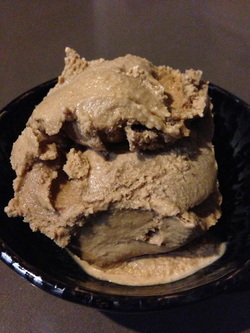 Once the mix is cool to the touch, move into your ice cream machine. You can adjust the amount of Vodka in this recipe to change the softness of it. More will keep it real soft and melt fast, less will thicken it up. Simple ingredients to make a wonderful treat. Great for after dinner drinks/dessert. Smooth, rich flavour with a hint of Vodka. 1. Open Champagne and leave open for 2 hours before using it. 2. Pour 2 1/2 cups of the Champagne into a medium pot with the sugar and lemon zest. 3. Bring to boil, then reduce heat so it is just lightly bubbling. 4. Stir with wooden spoon until sugar is dissolved. 6. Take off heat, cover and let cool down. 7. Move to metal mixing bowl, cover and put in refrigerator to cool down. 8. 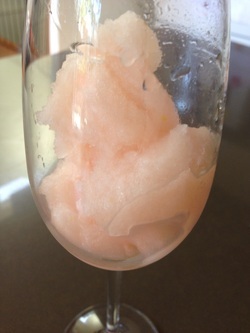 When cool, take out of refrigerator and add in the rest of the Champagne,lemon juice and the grapefruit juice. 9. Stir until all combined. 10. Add to your ice cream machine. I used a refrigerated ice cream machine, and had it on for about an hour and a half. If you have the machine where you put the bowl in the freezer over night, you may have to move the bowl and contents into the freezer after one cycle. Then after a few hours, put back in your machine. 1. Break up the bananas into a medium mixing bowl. 2. Add the sugars and milk into the bowl with the bananas. 3. Blend with a hand blender until the bananas are smooth, no lumps. 5. Continue Mixing with the hand blender until blended well. 6. Add mixture into your ice cream maker. Then enjoy when finished. 1. Add the sugar and evaporated milk into a medium mixing bowl and using a mixer, mix until sugar is dissolved. 2. Add in the cream cheese and continue to mix until smooth. 3. Add in the vanilla and keep mixing until combined well. 4. Add in the passionfruit pulp in syrup in and mix through. 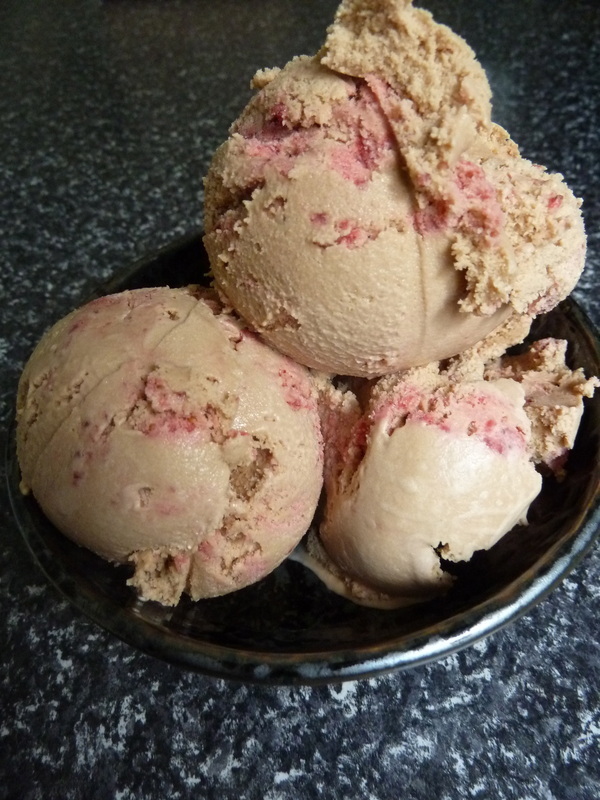 5.Add mix into ice cream maker. My son had the idea to serve this with cut up banana and drizzle over our home made caramel sauce. It was a great combination. In a double boiler or a metal mixing bowl over a pot with simmering water in it, melt the chocolate and sugar in the milk slowly. Use a wooden spoon to keep mixing the chocolate and milk until smooth and no lumps. Take off heat and let stand until the container has cooled. Then cover and refrigerate. Add the sugar and cherries into a medium mixing bowl. Use a hand blender to blend until sugar is dissolved and only small bits of the cherries are left. Add in the coconut and mix. Now add the cream and vanilla. Mix with a whisk until blended well. Add mixture into your ice cream maker. Stripe in dark chocolate sauce, as you add finished ice cream into container, layer of ice cream, then stripes, another layer of ice cream, until all ice cream is in the container. Add the sugar and milk into a medium mixing bowl. Use a whisk or mixer to mix until sugar is dissolved. Mix in the cream and vanilla. Add in 1 tbsp of the reduced balsamic vinegar and the salt and keep mixing. Taste after mixing. If needed, add more reduced balsamic vinegar a tsp at a time. Some reduced balsamic vinegars can have a stronger taste. When mixture starts to thicken, add in 1/2 cup strawberries mashed up. In a large heavy bottom pot put the water and sugar in, and heat on high, until boiling. Turn heat down to medium and continue to boil. Do not stir. If the edges start to brown quicker, swirl the pan. When the liquid is amber colour, take off heat, and whisk in the butter. When butter is all melted, mix in the cream and salt. Let cool, then pour into a glass container to store. Will keep for 2 weeks. Can be used to stripe in to ice cream, as you put into container. Use as a topping over your favourite ice cream. You can leave out the salt for another version and flavour for this topping. so add 1 tbsp (15 ml) at a time. 3 Ladyfingers Biscuit (cut in thin slices width wise) extra whole ones for serving. Add the sugar, milk and Mascarpone cheese into a medium mixing bowl. Use a hand blender to mix until blended and smooth. Add in the coffee liqueur one tbsp at a time. Mix well and then taste. If you need to, add the next tbsp of the coffee liqueur. Add in the rum and mix well. 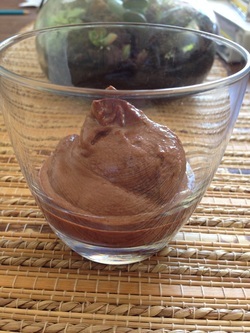 Once the taste is how you want it, place mixture into your ice cream maker. Drizzle a tiny bit of the coffee liqueur over the chopped biscuits. In the last 10 minutes add the chopped biscuits and grated chocolate. Serve with a ladyfinger biscuit cut in half, and top with a bit of grated chocolate. Add egg yolks and continue to mix until blended well. Put in the cream, vanilla, brandy, rum and the spices. Continue to mix until blended well. Combined all the dried fruit into a small bowl. As the mix starts to thicken, slowly spoon in the dried fruit a little at a time. I add about half the fruit at this time. 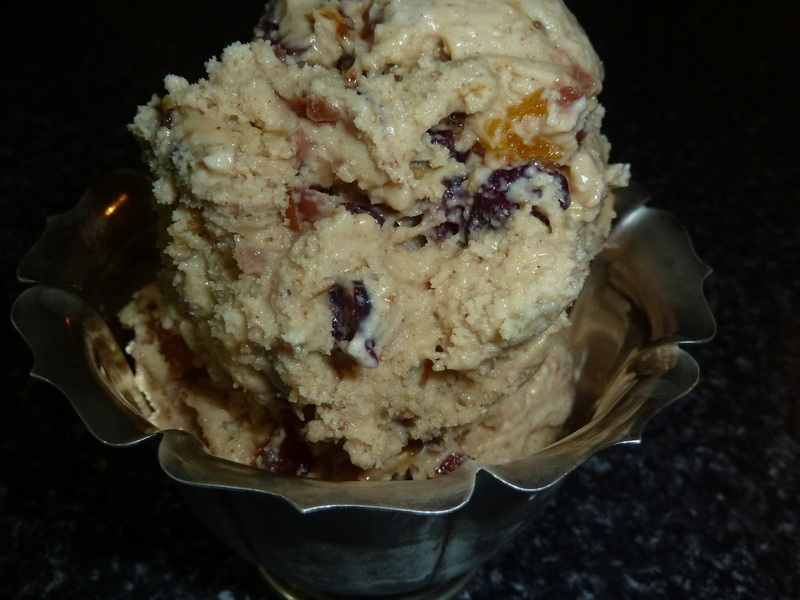 You can add any remaining fruit mix after you move the ice cream to a container.